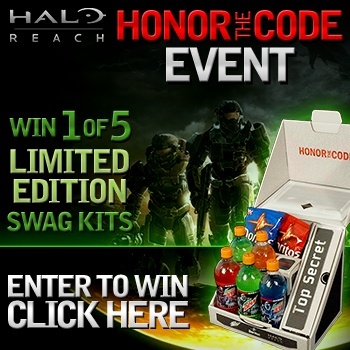 Win a Halo: Reach Honor the Code Limited Edition Kit! Enter the Halo: Reach Honor the Code sweepstakes for your chance to win one of five of these amazing swag kits! Back in September, Greg Tito received an awesome Limited Edition promo kit compliments of Doritos, Mountain Dew and Halo: Reach. Our community went wild over it, wondering how they could snag get a swag bag of their very own. Well, today is your lucky day! Thanks to Doritos, Mountain Dew and Halo: Reach, we have five of these Limited Edition kits to give away. Even better, this is open to all Escapist community members! Submissions will be open until next Thursday, November 11th, so don't delay. For rules on how to participate, click here. Honor the Code and good luck!